Airplanes are a boys best friend. 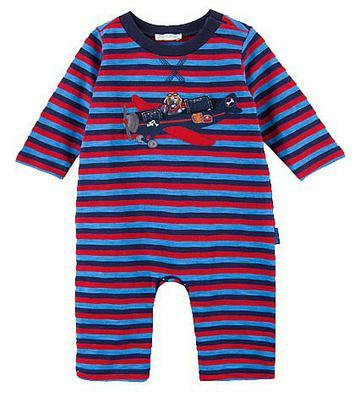 This adorable airplane applique is on the chest and has two squares that lift up to see whats inside the plane. The navy, red and royal blue striped one piece coverall has beautiful navy stitching at the neck. This onesie has two snaps at the shoulder to get over a childs head and snaps along the inside of the legs to accomodate easy diaper changes. This is 100% cotton.